It is also imperative that one takes the enzymes that are relevant to each phase of the digestion. 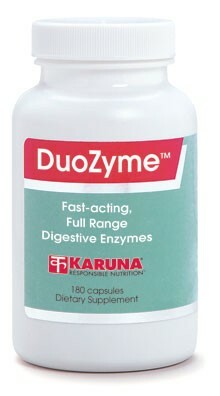 DuoZyme digestive enzymes are phase specific enzymes that make the digestion complete in both the phases. This way one can be assured that the food is fully processed and the nutrients can be absorbed properly. DuoZyme provides all the necessary enzymes for all types of molecules to relieve the person from any discomfort that is raised as a result of improper digestion. DuoZyme ingredients can be divided into 2 categories- gastric phase enzymes and intestinal phase enzyme. The intestinal phase is also called duodenal phase. Gastric phase is in the stomach where the food is semi-digested with the help of stomach acid and other enzymes. Betaine HCl is the primary digestive juice that breaks down the proteins, starch, and other molecules into their immediate components. It also acts as a barrier against microbes that are harmful. It compensates for the lack of enough stomach acid in the system and helps with proper digestion. Glutamic HCl is another digestive aid that can compensate for the stomach acid. People who eat a lot may have slow digestion and this glutamic HCl can help them get the digestion back on track. Papain is a digestive enzyme getting from papaya. It can break down the proteins into peptides and amino acids. It can break the peptide bonds either in the middle of the protein or on the ends. Pepsin breaks the protein molecules into its peptides. The rest of the digestion happens in the intestine. Pancreatin is the glandular extract to improve the digestion. It contains several enzymes that can digest most of the food molecules. Adding this in DuoZyme remedy the pancreatin insufficiency in some people. Protease helps the peptides to be broken into amino acids. Lipase deals with the lipids, fat, and oil. DuoZyme digestive enzymes supplements must be taken along with the meals or before the meals. The recommended dosage is 2-3 capsules with the meals of the day. Increased dosage is not good without the doctor’s advice. As for the side effects, that is less likely. It may help increase the digestion and helps you relieve of the symptoms rather than causing any side effects. People who have peptic ulcer would need caution in using DuoZyme as it contains HCl products. It could worsen their existing conditions. People with gluten intolerance have benefitted with the DuoZyme supplements. They no longer had any digestive problems after that. It has benefited both young and older people equally. It has helped many in digesting protein so they could have protein rich food for dinner and feel. None of them complained about any discomfort of using these supplements. DuoZyme saves many from the embarrassment by reducing digestive problems like gas, flatulence, acidity etc. They can now enjoy the parties without having to worry about these problems. With the enzymes relevant for both the digestive phases, it makes digestion complete by all means. It even allows the body to absorb the nutrients in the best possible way. Digestive problems are mainly due to lack of enough enzymes in the system to break down the food particles. There are numerous digestive supplements in the market to assist with this problem.